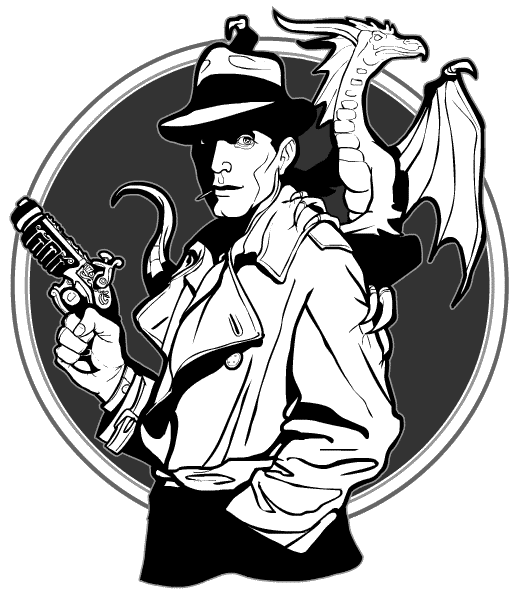 In an alternate universe, steampunk Humphrey Bogart chases down criminals with his trusty dragonet sidekick. Well done. There’s a lot going on there. It definitely gets the imagination going. Love this drawing, especially the way the dragon curls around his back and arms. What do you mean ‘alternate universe’? That’s exactly how I remember The Maltese Dragon. Ever read the Fanuilah book series? No steampunk guns, from what I recall, but otherwise you’ve got a good illustration of those as well. I like it. The dragon seems sentient and self-aware. Awesome. When I get it going, I’ll start posting it and email you the link so you can read it if you so wish. Definitely, I’d love that Imp. Ian, who posts here from time to time, also writes fiction, super-hero stuff mostly, and it’s very good. how can i make this on the heromachine???? Jordon, none of the Sketch of the Day illustrations are made in the HeroMachine. These are all hand-drawn by me and can’t really be replicated in the program.